This morning an incoming email ‘dinged’ on my laptop. It was from my friend Michelle, telling me that she’d gotten up early, gone to the gym, and on her way home, stopped to get what has become a regular staple in her diet: a green juice. 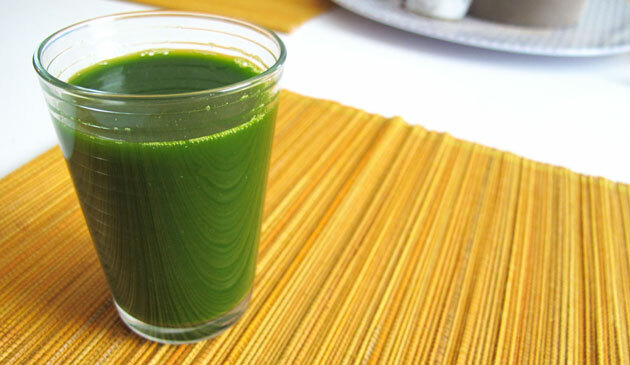 She and her husband have become regulars at their local juice place and her husband recently told me that he’s absolutely noticed a difference since having daily shots of wheatgrass and / or freshly squeezed juice: the undiagnosed skin rash on his arms has pretty much disappeared. It’s not a coincidence, for sure. I’ve read many theories stating that most skin irritations and inflammations including acne, rosacea, eczema, psoriasis, and even keratosis pilaris, are external cues that something is awry within the body, most often the gut, which plays directly with the endocrine system, affecting hormones. Everything is connected to everything it seems! I’m not going to go on and on about it, but if there was one time during which you choose to go organic, juicing would be the time. If you’re going to go out of your way to give your body the gift of unprocessed vitality, why would you compromise the safety and purity of it with the residue of scary chemicals? Go organic or buy from small/local farm where you know that they only treat their crops with the love and care of natural fertilizers and pesticides. Better yet: buy organic seeds and research natural soil, fertilizer and pesticide options, and grow your own! I have today off from work – such a rarity for me to have a weekday off- and I’ve promised myself (and others) that I’d spend it working on new blog posts. Michelle’s email inspired me to start my day with a green juice as well. I’ve read enough to know that the vitamins and minerals from the kale, spinach, cucumber, parsley, celery and lemon are best absorbed on an empty stomach, so I made sure it was the very first thing down the hatch, and I’m giving my body time to absorb all the goodness before having a proper breakfast. I also know that my stomach can be temperamental, so I always get the smallest juice possible, and I sip it. I’ve heard many stories from friends who’ve gulped down a green juice on an empty stomach and unfortunately experienced some discomfort, to say the least. Slow and steady and only in small amounts – that’s how to start this process. I get a fair share of emails from readers who say that they were inspired to try X, Y, or Z that I wrote about, and that it helped them in some way. I can’t tell you how super great that always makes me feel. Today I’m sharing the wealth and thanking Michelle for the inspiration to start my day off feeling as vibrant as this glass of juice looks. Have a great week everyone. Please let me know if you try the juice thing and how it goes. Now I’m off to write blog posts. Thank goodness for the clarity and focus I’m feeling from the glass of perfect green fuel with which I started my day. Later!